↑ "Daten und Fakten Hauptstadtregion". Berlin-Brandenburg.de. http://www.berlin-brandenburg.de/daten-fakten/. Retrieved on 10 February 2013. ↑ "Initiativkreis Europäische Metropolregionen in Deutschland: Berlin-Brandenburg". Deutsche-metropolregionen.org. http://www.deutsche-metropolregionen.org/mitglieder/berlin-brandenburg/. Retrieved on 10 February 2013. ↑ "PowerPoint-Präsentation" (PDF). http://www.eurometrex.org/Docs/Moscow/BerlinBrandenburg_planning_metropolitan_region_DE.pdf. Retrieved on 12 March 2013. ↑ "City Profiles Berlin". Urban Audit. http://www.urbanaudit.org/CityProfiles.aspx. Retrieved on 20 August 2008. ↑ Gren Berlin. Retrieved on 9 October 2009. ↑ "Documents of German Unification, 1848–1871". Modern History Sourcebook. http://www.fordham.edu/halsall/mod/germanunification.html. Retrieved on 18 August 2008. ↑ "Topographies of Class: Modern Architecture and Mass Society in Weimar Berlin (Social History, Popular Culture, and Politics in Germany).". www.h-net.org. http://www.h-net.org/reviews/showrev.php?id=23505. Retrieved on 9 October 2009. ↑ "Berlin Wall". Encyclopædia Britannica. http://www.britannica.com/EBchecked/topic/62202/Berlin-Wall. Retrieved on 18 August 2008. ↑ "Germany - Embassies and Consulates". embassypages.com. http://www.embassypages.com/germany. Retrieved on 23 August 2014. 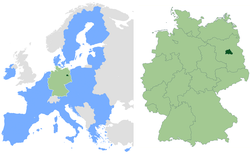 ↑ "Berlin – Capital of Germany". German Embassy in Washington. http://www.germany.info/Vertretung/usa/en/04__W__t__G/03/01/03/Feature__3.html. Retrieved on 18 August 2008. ↑ Davies, Catriona (10 April 2010). "Revealed: Cities that rule the world – and those on the rise". CNN. http://edition.cnn.com/2010/BUSINESS/04/10/cities.dominate.world/?hpt=C2. Retrieved on 11 اپریل 2010. ↑ Sifton, Sam (31 December 1969). "Berlin, the big canvas". The New York Times. http://www.nytimes.com/2008/06/22/travel/22iht-22berlin.13882912.html?_r=1. Retrieved on 18 اگست 2008. See also: "Sites and situations of leading cities in cultural globalisations/Media". GaWC Research Bulletin 146. http://www.lboro.ac.uk/gawc/rb/rb146.html#t5. Retrieved on 18 August 2008. ↑ Global Power City Index 2009. Tokyo, Japan. 22 October 2009. http://www.mori-m-foundation.or.jp/english/research/project/6/pdf/GPCI2009_English.pdf. Retrieved on 29 اکتوبر 2009. ↑ "ICCA publishes top 20 country and city rankings 2007". ICCA. http://www.iccaworld.com/npps/story.cfm?ID=1577. Retrieved on 18 August 2008. ↑ Berlin Beats Rome as Tourist Attraction as Hordes Descend. 4 September 2014. http://www.bloomberg.com/news/2014-09-03/berlin-beats-rome-as-tourist-attraction-as-hordes-descend.html. Retrieved on 11 ستمبر 2014. ↑ "World Heritage Site Museumsinsel". UNESCO. http://whc.unesco.org/en/list/896. Retrieved on 18 August 2008. ↑ "Hollywood Helps Revive Berlin's Former Movie Glory". Deutsche Welle. 9 August 2008. http://www.dw-world.de/dw/article/0,2144,3549403,00.html. Retrieved on 18 August 2008. ↑ Flint, Sunshine (12 December 2004). "The Club Scene, on the Edge". The New York Times. http://travel2.nytimes.com/2004/12/12/travel/12surf.html?ex=1150862400&en=f2c1cc6c507fea18&ei=5070. Retrieved on 18 اگست 2008. See also: "Ranking of best cities in the world". City mayors. http://www.citymayors.com/features/quality_survey.html. Retrieved on 18 August 2008. and "Quality Of Life Survey 2014". Monocle. http://monocle.com/film/affairs/quality-of-life-survey-2014/. Retrieved on 11 September 2014. ↑ Berger, Dieter (1999). Geographische Namen in Deutschland. Bibliographisches Institut. ISBN 3-411-06252-5. ↑ Steven Somers (14 July 2008). Those Crazy Germans! : A Lighthearted Guide to Germany. Xlibris Corporation, 12. ISBN 978-1-4535-6595-7. ↑ "Berlin dig finds city older than thought". Associated Press. ↑ "Berlin ist älter als gedacht: Hausreste aus dem Jahr 1174 entdeckt". dpa. http://www.berlin.de/aktuelles/berlin/2674414-958092-berlin-ist-aelter-als-gedacht-hausreste-.html. Retrieved on 24 اگست 2012. ↑ "Spandau Citadel". Berlin tourist board. https://web.archive.org/web/20080612020333/http://www.berlin.de/tourismus/sehenswuerdigkeiten.en/00175.html. Retrieved on 18 August 2008. ↑ "The medieval trading center". www.berlin.de. http://www.berlin.de/berlin-im-ueberblick/geschichte/handelsstadt.en.html. Retrieved on 11 June 2013. ↑ "The Hohenzollern Dynasty". Antipas. https://web.archive.org/web/20070807093738/http://www.west.net/~antipas/protected_files/news/europe/hohenzollerns.html. Retrieved on 18 August 2008. ↑ "Berlin Cathedral". SMPProtein. https://web.archive.org/web/20060818100934/http://www.smp-protein.de/SMPConference/berlin.htm. Retrieved on 18 August 2008. ↑ "Brandenburg during the 30 Years War". WHKMLA. http://www.zum.de/whkmla/region/germany/bra30.html. Retrieved on 18 August 2008. ↑ Thomas Carlyle (1853). Fraser's Magazine. J. Fraser, 63. ↑ W. Gunther Plaut (1 January 1995). Asylum: A Moral Dilemma. Greenwood Publishing Group, 42. ISBN 978-0-275-95196-2. ↑ Jeremy Gray (2007). Germany. Lonely Planet, 49. ISBN 978-1-74059-988-7. ↑ Roman Adrian Cybriwsky (23 May 2013). Capital Cities around the World: An Encyclopedia of Geography, History, and Culture: An Encyclopedia of Geography, History, and Culture. ABC-CLIO, 48. ISBN 978-1-61069-248-9. ↑ Gregorio F. Zaide (1965). World History. Rex Bookstore, Inc., 273. ISBN 978-971-23-1472-8. ↑ (1 January 2012) Western Civilization: Ideas, Politics, and Society. Cengage Learning, 444. ISBN 1-133-70864-1. ↑ Peter B. Lewis (15 February 2013). Arthur Schopenhauer. Reaktion Books, 57. ISBN 978-1-78023-069-6. ↑ (28 December 2010) Let's Go Berlin, Prague & Budapest: The Student Travel Guide. Avalon Travel, 83. ISBN 1-59880-914-8.